If you've been coming around here somewhat longer, you might have seen me rave about this series before. Because it's FREAKING AMAZING!!! SERIOUSLY!! The little romantic inside of me cheers the whole time while reading these books. Pretty loudly, I might add. So, I read a bunch of romance books. And some of it isn't great. But these books right here? They are so great. 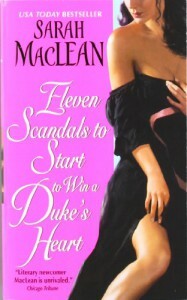 I love how Sarah MacLean writes! She is such an amazing storyteller and I just love her. Sometimes I don't like to read series of romance novels, cause it can get a bit boring and repetitive, but here I really liked it. Juliana was introduced in the first book and I've grown to love her along the way. So to have her as the main character in this one was just great. And I liked getting to know her even better and revisiting the characters from the previous books. In the previous two books I didn't think much of Simon, but he turns out to be as swoonworthy as I've come to expect from MacLean's heroes. Gosh, I really loved the chemistry between Simon and Juliana and it was all so romantic! This one is completely recommended, as well as the rest of the series, to anyone who even remotely likes historical romance. It's brilliant and it will make you fall in love with the characters. I absolutely loved it!